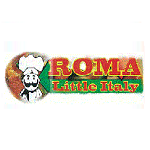 About Roma Little Italy - E. Fayette St.
Mushrooms, onion, green peppers, black olives, tomatoes, and extra cheese. Served with choice of side and can soda. Ham, Turkey, and roast beef. Served with choice of side and can soda. One crab cake, three shrimp, one fish, fries, and coleslaw. Served with choice of side and boiled egg. Choice of pasta, garlic bread, and salad. Feta cheese, gyro meat, extra cheese, tomato, green peppers, onion, and black olives. Monterey jack, mozzarella, and ricotta cheese. Steak, green peppers, mushrooms, and onion. With six pieces of buffalo wings and fries. Green peppers, onions, mushrooms, tomato, and black olives. Ten pieces. With ranch dressing. Eight pieces. With marinara sauce.